Back in December, I had this bright idea that if we tracked our fruit & vegetable servings to make sure we were getting enough, we’d eat more of these good things. Then, hopefully we’d have less room for all the sugary stuff that comes along in December and overall we’d eat less junk. Sounds great, right? It kind of worked. We’re a list family of 4 confirmed type-A’s, so checking a box whenever we eat a serving of fruit or vegetables is no big deal. We kept it up for the first few weeks. But, as soon as our extended family arrived to stay with us for a while over the holidays, we fizzled out. The kids were the first to stop and I just didn’t have the energy to remind them. With a full house of chaos and fun, it was just too much. So, here we are the first of the year, and we’re bringing the checklists back. 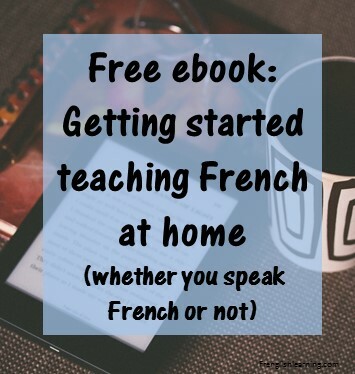 I thought I’d share them with you just in case you’d like to take a small step for good health in this New Year and learn some French vocabulary at the same time. Download the checklist: défi des legumes. 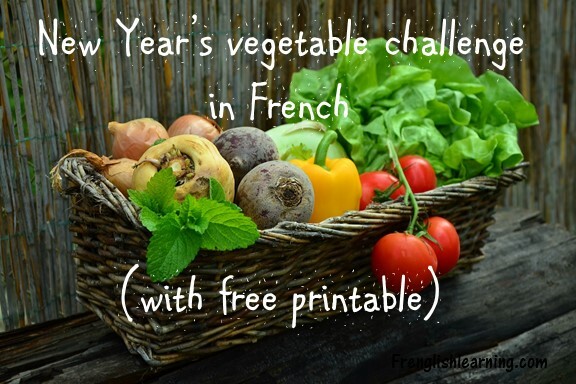 Note that when I was telling my kids about this, I called it the vegetable challenge or le défi des légumes. Sounds a lot more interesting than here, fill this out. Health Canada recommendations here or use whatever your own convictions tell you. Since the number of recommended servings varies depending on whether you are a man, woman, or child, the target will vary for each family member, so there are 3 worksheets in the file. Before we started, I asked my husband what he wanted his target to be. I told him that Canada’s food guide recommends 8-10 servings of fruits & vegetables for men between the ages of 19-50. He decided on 9 servings. I decided on 8 servings for myself and 6 servings for our kids. Start slowly! The idea here is that we’re going for an easy win to make us feel like we can do this and give motivation to continue. We started with 2 vegetable servings and 2 fruit servings for the adults and kids alike. I knew that we were all getting more than this on most days anyway so it was more to get into the habit of marking it down for week 1. Week 2 was 3 vegetables and 2 fruits for everyone; week 3 was 4 and 2. After the first 3 weeks, the kids had reached their target so we kept their checklists the same going forward – 4 servings of vegetables and 2 servings of fruit each day. For the adults, we kept adding a serving of vegetables per week until we each reached our targets. When you have the file open on your machine, you can choose “Insert” from the top, then Header & Footer. I put our family member’s names on the top of their sheets. If you want to skip this step, you can just write it in after printing. The date is set to Jan 1 at the top. If you’re reading this post after I originally wrote it, you can change the first date to whatever you want it to be and then the rest of the dates will update automatically. I would recommend putting your first date as a Sunday so that the days of the week stay correct without you having to manually update them. For example, if you start Tuesday, January 10, put Jan 8th in the first row and start checking off on the 10th. If you need to adjust the number of servings, feel free to modify the sheet as needed. The day before we normally go grocery shopping, a reminder pops up on everyone’s to-do list to add the fruits & vegetables to the shopping list that they’d like for the week. We have some that we buy each time, but we encourage the kids to add any specific ones that they’d like to see in the fridge. We are now buying hummus weekly as well to add a little protein and make raw veggie snacks a little more interesting. My kids chop a lot of their own vegetables, so I don’t have to do it. I just ask them to please call me in to supervise when they’d like to do a sweet pepper because they’ve only done those a few times and they are tricky. A few more weeks of practice should do it and we’ll all be comfortable with them tackling peppers on their own. 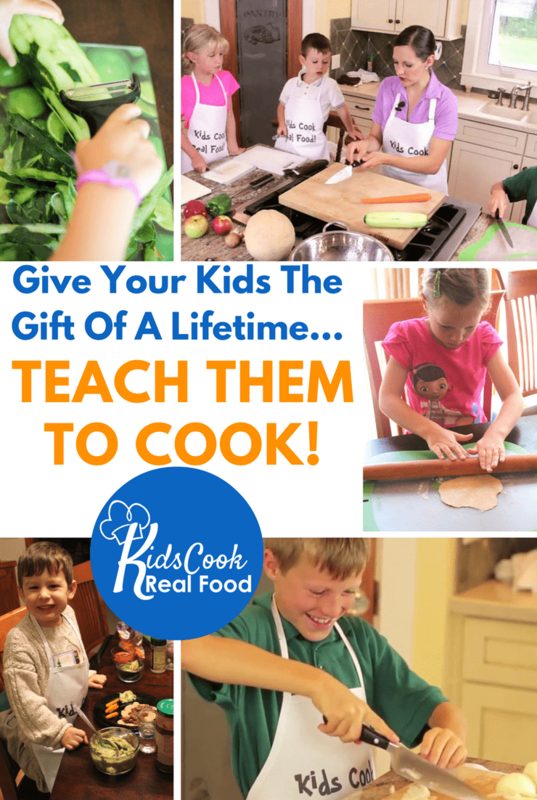 I taught my kids to use knives safely with the Kids Cook Real Food eCourse (in English). The knife skills lessons are available for download free of charge from now until January 18. You can grab them here.